As the sun returns to the far north and days get longer and warmer, preparations for the busy Arctic field season are already in full swing at lower latitudes. With a team of polar experts who specialize in planning and implementing field logistics, Polar Field Services (PFS) plays a critical role in preparing researchers funded by the National Science Foundation (NSF) for a successful field season. As part of the PFS risk management program, custom Arctic Field Training (AFT) courses are provided for individuals, small groups, and large teams deploying to the Arctic. PFS is proud that interest and demand from the research community continue to grow each year. The PFS AFT course prepares researchers and students for the challenges of living and working at high latitudes. Pictures from the 2017 Polaris Project field camp in Alaska. Photo credit: Kevin Pettway. 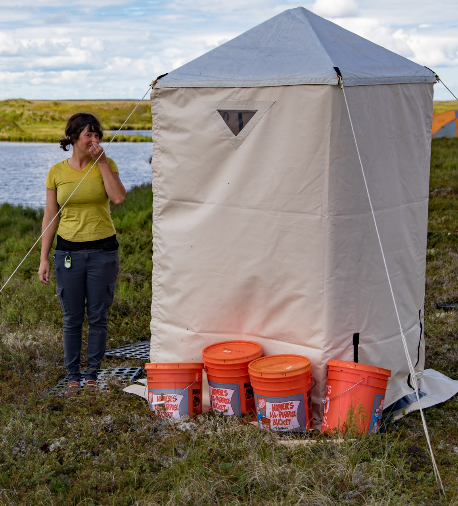 Arctic field work is often conducted in remote, inhospitable, and challenging locations where participants are exposed to intense environmental conditions, wildlife challenges, sensitive ecosystems, and rugged camping. Recognizing that a successful field season requires comprehensive planning and advanced preparation, the PFS AFT course is designed to help researchers and students mitigate challenges on the front end, to ensure that time in the field is productive and positive. Working directly with Principle Investigators and team leaders, the PFS team determines what topics are most relevant and important for each group, and designs and delivers custom curriculum to meet those needs. Each course offers hands-on and classroom training covering a wide range of topics, including bears and wildlife, driving, field planning, cold and heat, gear and tents, communications, hygiene, injuries and first aid, minimizing environmental impact, and risk assessment. Additionally, added to the curriculum in 2018 is discussion of respect, inclusiveness, and bullying and harassment awareness. Feedback from these courses has been tremendously positive, with seasoned Arctic veterans and Arctic first-timers benefiting and participating collaboratively in a constructive learning environment. Day-to-day activities that may seem routine in your normal life can be daunting and complicated when working, living, and camping in far flung remote locations. The PFS AFT trainers navigate these topics in an encouraging and positive learning style that fosters a community of trust, respect, and good stewardship practices. Polaris Project students learn how to setup tents during the PFS AFT course. Photo Credit: John Schade. Working in partnership, PFS’s Kevin Pettway and Matt Irinaga traveled to Woods Hole Research Center in Massachusetts to provide AFT training for the Polaris Project, as they prepare for their annual research expedition to a remote area of the Yukon-Kuskokwim Delta in Alaska. Since 2008, the Polaris Project has engaged diverse groups of undergraduate students in cutting-edge research, providing them encouragement, mentoring, and opportunities to continue pursuing Arctic studies. Undergraduates work with a team of scientists to explore global climate change, studying the fate of permafrost locked carbon as global temperatures increase, melting and releasing carbon to the atmosphere. Map of Alaska showing the Yukon-Kuskokwim Delta where the Polaris Project expedition will camp during summer 2018. Image credit: Polaris Project. As the Polaris Project Expedition Leader, Sue Natali will lead a team of 18 students and scientists – including 10 undergraduate students from nine different institutions - traveling to Alaska in late June. 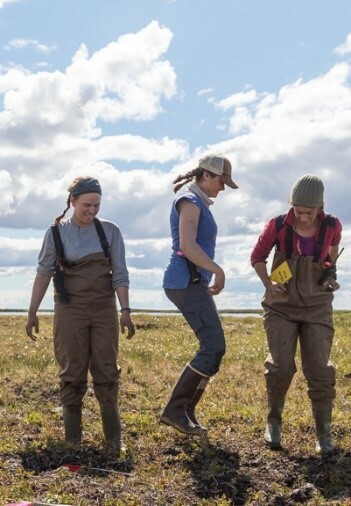 Located in the Kuka Creek area 40 miles northeast of Bethel, AK, and only reachable by helicopter and float plane, the field camp is remote and provides an ideal setting for students to have an authentic and meaningful research experience. Coming from diverse backgrounds, for many of the students it will be their first time to Alaska, first time camping, and first time living in a close-knit field camp community. PFS Alaska Operations Manager and AFT trainer, Matt Irinaga, observes Polaris Project student deploy a practice canister of bear spray. Photo credit: John Schade. Interested in learning more about the Polaris Project at Woods Hole Research Center? Learn more about the project, see pictures of the team, and follow their progress through the 2018 field season: http://www.thepolarisproject.org/. Where to next? The next stop for the PFS AFT course is the University of California Santa Cruz to work with PI Beth Shapiro to provide training for students and researchers participating in the Arctic Ecology and Environmental Change field program. The 2018 PFS AFT course schedule is available at http://cpspolar.com/for-researchers/risk-management/field-training-schedule/. Interested in planning an AFT course for your next trip to the Arctic? If you are a NSF researcher and would like to participate in an AFT course, stay tuned for courses offered for the 2019 field season. Announcements and planning for 2019 AFT course schedule will be begin fall 2018. Funding for NSF grantees is available to cover course costs and travel. Plan ahead and contact PFS early to start organizing your custom AFT course!